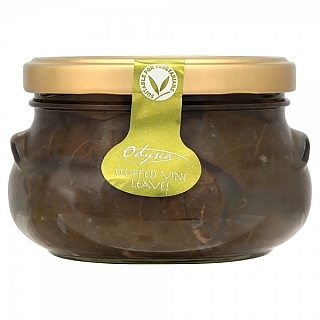 A traditional Greek appetiser of tender vine leaves with a savoury rice and onion filling, seasoned with mint and dill, in extra virgin olive oil. Rolled by hand to ensure the filling is perfectly encased within the leaf. Storage: Store in a cupboard. Once open store in a fridge and consume within 7 days. Dietary Information: Suitable for vegetarians and vegans. Gluten and wheat free. Nut free. Egg free. Lactose free. Cooked Rice (35%), Water, Onions, Vine Leaves (15%), Extra Virgin Olive Oil (9.5%), Raisins (3%), Salt, Pine Nuts (0.9%), Herbs, Acidity Regulator (Citric Acid), Spices. Delicious served at room temperature alongside other Greek mezes.